Erik Cohen is a psychiatrist that is sent to the overcrowding in the Jewish ghetto in Warsaw. His life is only supported by the company of his niece Stefa, the son of hers, Adam, as well as his beloved friend Izzy. The oppression of the Nazis and the death are the daily bread and nobody wants to pay attention when it happens. In some way, that's the best way to keep yourself alive. The fragile balance of Erik's life is broken when Adam is found murdered and it leads to Stefa's suicide. With the help of Izzy and motivated by his own sadness and anger, Erik is determined to find the murder even without think what he may do once the truth is revealed. Richard Zimler brings us a shocking picture of the history of Poland in the times of the WWII. The plot is nothing else but a good argument to show us a brave, well documented and disheartening evidence of the injustice and suffering of the Jews as well as their strong will to survive. Keep an eye on: the descriptions of all elements of the ghetto: habits, manners and commerce. The linguistic resources from Yiddish. 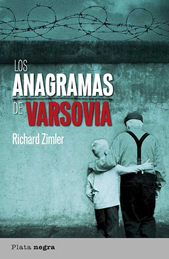 The Warsaw Anagrams is a novel that will grab you until the last page. Richard Zimler along with Ira Levin, Philip Kerr, Frederick Forsyth and Gauke Andriesse, constitute a priceless and brave effort to all of them that want to know about the Holocaust and many other aspects related with it. Certainly these are all fiction writers, however, the accuracy of their descriptions blended to brilliant plots may suffice to understand and never forget.